There is a lot happening behind the scenes here at SITS and it's time to pull back the curtain. 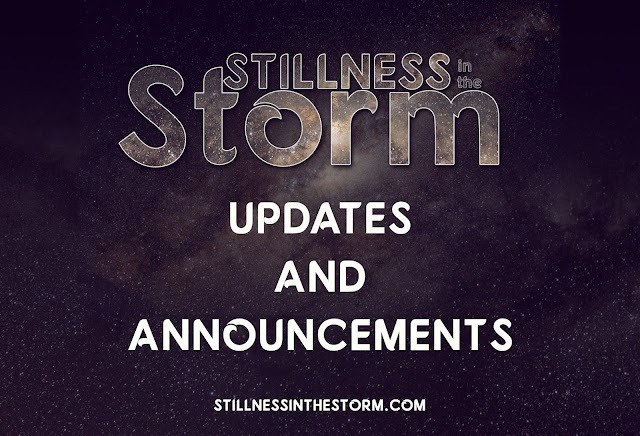 Firstly, the URL or web address for SITS has been changed to www.stillnessinthestorm.com. This is how the website now appears in the URL field of your chosen browser. If you use old addresses (like sitsshow.blogspot.com), you will be redirected to the correct website. There shouldn't be any problems accessing to the site, however sometimes the cache of your browser will cause loading issues. If that happens, clear the cache and browsing history. As time goes on, this rare intermittent problem should disappear entirely. Unfortunately, due to the nature of how adsense approves web sites, all of the ads have been taken down while they review SITS under the new URL. I have already had my "hand slapped" for posting "sensitive articles,"—they said I can take down the content or risk losing their service. Given Google's efforts to de-fund the awakening movement, SITS could also find itself without a large source of revenue, which will require some major changes in order to keep things going. Secondly, as some of you may have noticed, there has been less original content produced by me, Justin Deschamps. This is partly because I am presently conducting extensive research into psychology, consciousness, and law (to name a few) in an effort to better be of service for the great work of sharing the truth and helping others become self-mastered, empowered people. I have been releasing snippets of my findings in various articles, and I plan to release more of this research as time goes on. I've also been working to develop different methods and techniques for tackling some of the problems we face, such as arrested development of the human psyche, deep trauma, discernment techniques, and so on. I am working with several people to develop a lawful infrastructure that facilitates cooperation, specifically in the truth movement that has been so crippled by divide and conquer campaigns. This infrastructure will not only provide a platform for discussing topics of information with others freely but also the legal and lawful support needed to protect ourselves from the tyrannical state while supporting solution projects of all types. The World Healers Imperative, as it is being called, is designed and intended to bridge the gap between awakening minds that are truly willing to do the inner and outer work to be the change. Thirdly, I have been receiving "downloads" on a regular basis, which I do my best to write down. They come through during moments of contemplation, philosophy, insight, and meditation, usually when I feel the most alive and invested in my experience. I tend to write these things in my own language I've developed over the years for thinking to myself, so sharing things with others often requires translation work.Often, so much comes through during these storms of inspiration and insight that it's hard to put them into words for record-keeping purposes. Suffice it to say, I have dozens upon dozens of axioms, musings, and observations that I think are of value, and I plan to share in the future when I can shape them into a form that others can comprehend—above and beyond Justin-speak. Unfortunately, (or fortunately, depending on how you look at it), I am a holistic synthesis thinker, which means I tend to generate insights based on the fabric of data and information I'm reviewing at any given time—whether from books, audio-visual media, conversation, or quiet reflection. Sharing these ideas completely and clearly can be challenging because the concepts often rest on top of a host of other ideas, (the tip of an iceberg vs. what lies beneath the surface), and unless those are firmly grasped as well, the insight likely won't be understood. That being said, I hazard to say that I have reached a new level of development with my research and awakening, drawing upon a lifetime's worth of deep thinking and contemplation about everything I've learned over the years. And what I've discovered could help heal various personality issues that hold us back while also providing tools to help others in their awakening—even how to deal with the uninitiated masses so that we can end the madness of this world once and for all. And this is just a taste of what is being developed in partnership with other world healers, as I call them. I will reveal details as I am able. But for now, I need to keep things quiet for two reasons. One, operational security so that the sensitive aspects of the work are not compromised; and two, because much is still in an embryonic stage and just isn't ready for public release. And finally, for those who may not be aware, for years SITS was managed full-time by two people, myself and Julian Robles. But when Julian transitioned to spirit in August of 2015, all of that managerial work fell on my shoulders, and I have been working seven days a week, often 12 hours a day, or more, to maintain everything that makes SITS what it is. As one might expect, this is an unsustainable situation. My research and contemplation (philosophy) time fell by the wayside when this happened, which hindered my personal growth, and subsequently, the quality of work I produce here. Furthermore, the mountains of managerial work that needs to be done everyday has a tendency of limiting the mystical side of my soul growth and spiritual mission. This is one reason why Gaia Portal and Cosmic Disclosure articles haven't been as frequent because these take a tremendous amount of time and energy, especially analysis work. Often a single Cosmic Disclosure article takes me about 20 hours to produce, usually three to four days of work. Thankfully, the passion of the great work helps motivate me when long hours are needed, but starring endlessly into a computer screen day in day out isn't beneficial over the long haul. In light of this, about six months ago I began pulling back on some of the creative work and prioritized research and contemplation. The results have been vitalizing and beneficial; as I said, I rekindled my inspiration wellspring to the extent that I can barely keep up with all the insights, ideas, and solutions that seem to be pouring in at all times. Arguably, this is a "good" problem to have, but there's still a lot of internal metaphysical organizational work that needs to go with it so I don't get overwhelmed. And the bottom line is, I can't do it alone, which brings me to my next update. The SITS enterprise is growing as well. The theme of SITS is that of striving for a balanced, objective perspective on all the information swirling around us at any given time. But obviously, there's only so much I can do as one man. To that end, I hope to find other inspired and dedicated people who want to contribute to this effort, whether they are writers, researchers, web developers, presenters, and so on. For now, the love of doing this work will have to be its own reward. But in the future, I hope to set up SITS so that it can provide financial compensation for those who contribute beneficially to the work we're doing here. Especially because when one can produce income while also doing the great work, they can invest themselves more fully and have a much greater impact. As time allows, I will be interviewing collaborators who want to come on as editors to post news and information that falls within the purview of SITS. Such individuals will need to be detail-oriented, self motivated, objective, capable of fact-checking, and have good computer skills for producing articles using web tools like the blogger dashboard. At present, only about 25% of the articles I review for publication make the cut, usually because I just don't have enough time go through them all. But with some collaboration from others, we can share even more mind stimulating and soul enriching information. And this will free up time for me to do analysis and writing work, which is apparently something the readers, and I, enjoy. I also plan to do more video-style content, as this media form is a great way to present information to those who don't have time to read in-depth articles. I have a large list of axiomatic writings I've been compiling that I plan to turn into a line of products, like t-shirts, posters, and so on. And I will be adding additional advertising to the site as well—but not in a way that disturbs the reading experience. While I do not do this work for money, it is a resource that is needed to keep the work going, and if more revenue was available, more work could be done in all respects. On this score, the idea that we can't do good work of humanity while also making money needs to be set aside, as it is presently being used as a divide and conquer tactic within the awakening community. Until now, most truthers I have spoken to feel isolated, and as such, incapable of doing anything to be the change in a meaningful way. However, this paradigm of division is slowly changing, and with it, our ability as an awakening community to realize a better world is also improving. What I want to contribute to this global effort will hopefully enhance how each of us works together for freedom and truth. On the issue of making money from doing the great work, I've had the pleasure of meeting several prominent figures in the truth movement, and I can tell you (despite their repent popularity on Youtube, the conference circuit, or elsewhere), the majority of them (that I've met) live in impoverished conditions. One truth the awakening community would do well to recognize: just because you have a message and you are popular doesn't mean you know how to make a business out of it or that you have no financial worries. I can't tell you how many messages I receive from people saying this or that person is a disinformation agent or shill because they have ads on their site, or offer a product line to generate revenue. To be sure, there are shills and disinformation agents out there, but making money from the work you do isn't proof positive of that. And frankly, even if someone was making enough money to be considered "too rich to be spiritual" (if that is even possible) does it change what we can do with their information? Does it make their data any less impact in our personal growth and evolution? Wouldn't it make more sense for us, the consumers of awakening media, to encourage the luminaries in the field to work together—and with us—to support themselves so the work of healing the planet can progress forward quickly? I think we would benefit from being a little less radically idealistic and a bit more inclusively pragmatic. As was mentioned in previous articles, the powers that should not be work together to achieve their goals and we should too. We can develop networks of support for all things, from information sharing and comprehension to life skill development to healing and restoration of humanity and the planet. With cooperation and dedication to truth on our side, almost any obstacle can be overcome—we're in this together whether we like it or not. I have made connections with several "big names" towards this end, and look forward to releasing updates soon. Finally, I will be attending the Contact in the Desert (CID) event this year in Joshua Tree, California. I hope to do some modest media coverage while I am there, as time allows. And I will be meeting up with a friend and colleague whom you all know, Jordan Sather of Destroying the Illusion. He's doing some great work in his own respect. And I look forward to meeting all my friends and colleagues in the great work as well! As readers of this site likely know, I am a proponent of real justice and honest cooperation—I hope to lend any support I can to ameliorate any drama that might unfold during the CID event. This is the idea that when you finally do enough inner work to heal your trauma (gaining self-mastery), this frees up consciousness energy to begin your education in all things truth. As you develop more and more positive (truthful) knowledge and wisdom, an abundance of ideas, insights, and musings flow in. You go from feeling ineffective and dis-empowered to feeling like you can meet any challenge life has to offer. As Dr. Jordan Peterson has stated, when you take on the burdens of the world, it can be overwhelming, but it can give you purpose and meaning in life—which are absolutely necessary for spiritual survival. Eventually, a critical mass is reached with your education so that you can actually use what you've learned to make your life and the world around you better. If each of us worked to reduce the suffering of others, how much could we do? It seems like more and more people are reaching this state of attainment, as the awakening proceeds at pace. But it's all too easy to develop what I've termed an Atlas Complex, where you feel like all the world's problems are yours alone to bear. The good news is that with each person who does the inner work to reach this over-unity state, the burden gets a little lighter for all involved—but only if we can learn to work with each other. Each of you is likely making great strides in your spheres of personal work and evolution. And I look forward to the day when all those hours, days, weeks, and months of dedicated truth-seeking begin to bear the fruit of a better world for ourselves and others. This article (Stillness in the Storm Updates: Stillnesinthstorm.com, Behind the Scenes Research and Developments, and Contact in the Desert) by Justin Deschamps originally appeared on StillnessintheStorm.com and is free and open source. You have permission to share or republish this article in full so long as attribution to the author and stillnessinthestorm.com are provided. If you spot a typo, email sitsshow@gmail.com.